The announcement that a donor match has been found for Qavah has led to a long "to do" list. Kathryn spent nearly two weeks scanning a complete set of records for Qavah's new doctors and has them ready to send on a disc. My van passed inspection but I was told that the tires needed to be replaced before a long road trip. They will be ordered and replaced this week. We'll celebrate the holidays and then start the visits to Pittsburgh, Lord willing. Paul has been busy working on the sun-room whenever he has a chance. We are hoping to have it usable within a few weeks. Today, we visited Mom and Dad Campbell and sat in the warmth of their sun-room which overlooks the valley and the Blue Ridge Mountain range. It was quiet, warm, restful, and pleasant. It gave us a strong desire to get back to work on ours. 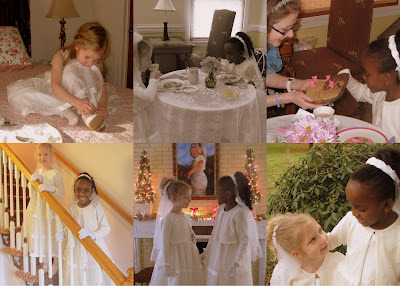 One of the highlights of the weekend was hosting a special tea party for Annelise. Qavah wanted to have a special tea for Annelise's birthday, so the girls had their fingernails painted, their hair made into a little "up-do", and they put on their dresses for a memorable event. These two little girls are a joy to watch. Their friendship warms my heart. Click on any picture below to enlarge the collage.